Very comfortable city centre hotel in a good location for most, airport, motorway and railway. great swimming pool/ steam room/ sauna are and small but well appointed fitness all the staff I spoke to were great. I did not use the bar etc because I originally come from Glasgow and have my own haunts. The aircon rattled a bit but was not really necessary overnight so I switched it off, the safe malfunctioned but was repaired in minutes. My only criticism was the cost of internet which I was not prepared to pay for especially as I could see from my phone that the wifi signal was weak (there was no lan connection available), however, this would not stop me using the hotel on my next trip to Glasgow. 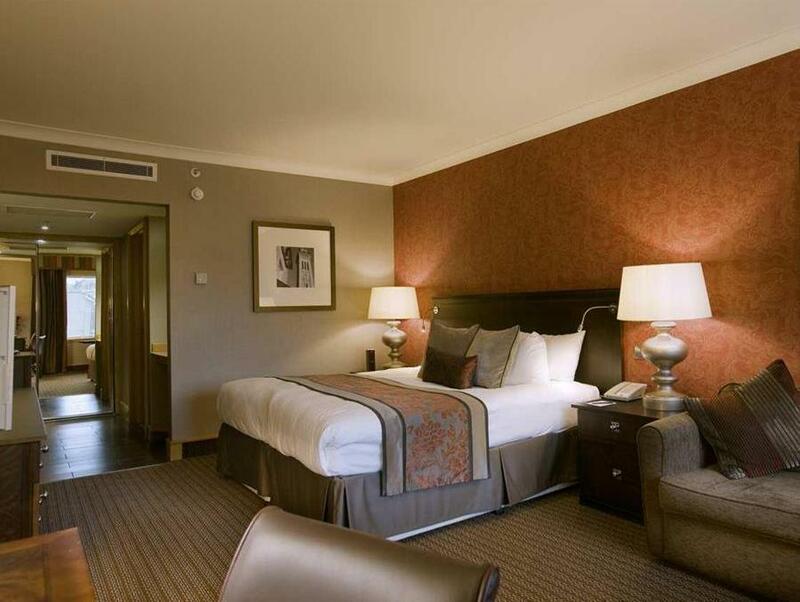 The Hilton Glasgow hotel located near to the highway which is the first stop from Glasgow Airport. It took approximate 30 minutes from the Glasgow Airport. Although its location is at the edge of the Glasgow centre, it only takes 10 minutes walk to the Glasgow center. The hotel room is very clean, tidy and sufficient space. You will find everthing you want at the room. Good price and highly recommend. Breakfast was exceptionally good. Great choice and lovely tasting. Would stay again 100%. The room was clean and a good size, all staff were very helpful, breakfast buffet was well stocked and great quality. The hotel was between the town centre and university - convenient for what I needed. Parking was easy, as was finding the hotel. We stayed here after our wedding and upon check in were surprised to find we had been upgraded to an executive room. There were chocolate covered strawberries and champagne waiting for us and the room looked fab! We had paid for breakfast but we got to order it to our room and the lady who brought it even congratulated us. Top service. Lovely staff. A great anniversary stay where the hotel gave us surprise champagne and chocolates, thanks, easy 10-15min straight walk from central station though hotel lacks decent pavement access? Plenty of taxi's waiting at door £5-6 into centre. Glasgow great for night out and food..
Bar staff were excellent, food & drink was lovely, close to town. Check on says 3pm, we arrived at 1.45 and room was not ready until 3.45, not good service. Getting charged an extra £17 to get roomservice breakfast in a five star hotel is totally rediculaus, when we received the breakfast it was not very hot and getting a phone call in our room at 8am to ask how we were paying the fee!!! £12 charge for a car park in a five star hotel is also shocking. It was very good. You've not asked what we didn't like but we thought the car park very tight and the coffee in your coffee machines was too milky and didn't like it. We don't think the settings on the machine were quite right. Location for Airport, shopping and restaurants. We had a very pleasant stay at the Hilton in Glasgow. It was very convenient for shopping with Argylle Street a short walk away. It was also well placed on the side of the city to reach the airport. Staff were professional and courteous. The rooms were clean and room staff very helpful and vigilant. We found a range of good restaurants within walking distance of the hotel. Breakfast was good although refreshing of the foodstuffs on offer could be slow. The Hotel entrance was a bit challenging to locate as we were driving and it was not visible. Another difficulty was getting into the car park as the ramp down was small and very tight. Staff was very friendly and accommodating, very clear on the areas of interest around the Hotel. Rooms were well maintained, clean and comfortable. We had a chance to use the gym and it was well stocked with machines and weights. Breakfast was excellent and the spread was international, quality was good. Will recommend it if you visit Glasgow. Beautiful foyer, friendly staff, extremely comfortable bed, excellent spa & pool facilities. as mentioned above it was a very enjoyable stay at the glasgow hilton, i have already recommened friends to stay and will definatley be booking again.....the only downside was that the television's USB function was not activated - therefore could not access any personal music/films that we had brought with us. Location, friendly staff and confortable room. Excellent. The only downside is the in room internet pricing , nearly $ 15,00 pounds per day. Many other hotels offer in room internet at reasonable average price. Hilton do offer free wi fi at the lobby what is a plus, but should the price for the access in the room be reasonable, O would rather stay in my room." Sometimes you really need a big, reliable chain hotel. My wife and I had become ill on a multi-day Spey River decent by canoe. We were due back in a small town near Glasgow the next day. The Glasgow Hilton provided the perfect place to arrive late, dust ourselves off, sleep for twelve hours and leave refreshed. Our only gripe was that the windows (on the eighth floors) didn't open, not even the tiniest crack. We arrived tired after an early start and a long train journey and were delighted to be allowed to check in early. It is this type of service which creates brand loyalty and ensures further bookings. Also very good breakfast. Fantastic! stayed in many hotels in the city centre but these rooms have to top them all, the hotel oozes quality and is ideal for a nice treat! One thing, it's really expensive! for a mars bar! for breakfast, however its ideally located, 5 mins in any direction and you can find great bars and restaurants. In city centre next to starbucks and millions of restaurants around. Large room, well furnished and clean. Cant ask for more. Forgot my expensive camera set, they sent by courier. Thx. 5 stars. Would stay again if in glasgow. Superb spa and swimming pool. Son loved it. Good size gym and equipments. Good restaurant, slightly expensive though. Try getting a deal with breakfast. This was our second time at the Hilto Glasgow and not disappointed. The hotel main lobby layout has changed since we stayed here earlier in the year - the bar was better before in my opinion but still a great bar and excellent quality food on room service! สถานีรถไฟ Anderston - ระยะ 0.21 กม.